Please read our Guidelines & Polices before purchasing. *International Orders (Please read before ordering)! This absolutely exquisite emerald green and cream colored goose egg would inhance any room that it is in!! Each one is delicately hand made and crafted to perfection and plays the tune "Swam Lake". Absolutely beautiful, is this musical Bride and Groom goose egg , plays "I will always love you". Each one is delicately hand made and crafted to perfection. Includes a certificate of authenticity. Limited edition. A perfect gift to say 'I Love You"! 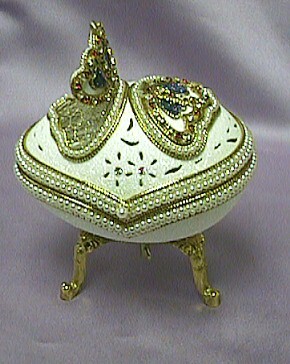 Absolutely beautiful, is this musical goose jewelry box egg. Each one is delicately hand made and crafted to perfection. Features two doors that open to reveal a fully lined satin interior and includes a certificate of authenticity. Plays the ever popular "I Will Always Love You". 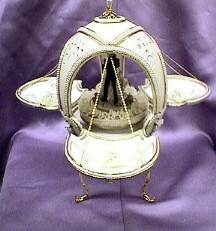 Absolutely beautiful, is this musical merry go round carousel, revolving inside a spectacular hand carved goose egg. Each one is delicately hand made and crafted to perfection. Features two carved doors, that open to reveal the merry go round inside, includes a certificate of authenticity. Limited edition. Plays the ever popular "Somewhere in time". Absolutely beautiful, Limited Edition Collectors Musical Goose Egg. 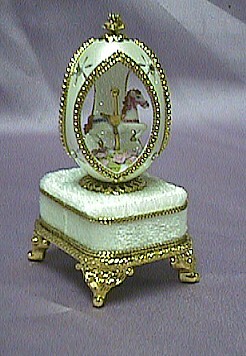 Exquisite detail and each one is delicately hand made and crafted to perfection from six goose eggs. 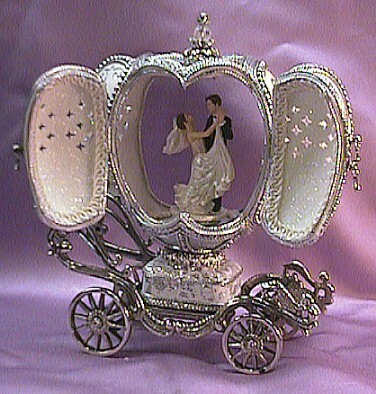 Features a revolving bride and groom, four opening doors a strong metal carriage in a silver lacquer finish. Includes a certificate of authenticity and the limited number of the piece. A perfect wedding or anniversary gift to say "I Love You"! Click on image to see inside. Absolutely Exquisite, Limited Edition Collectors Musical Goose Egg. 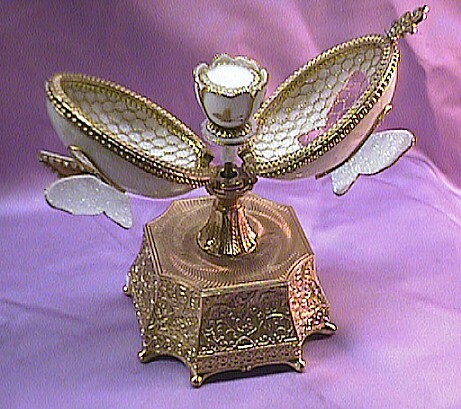 You have to see this one to believe the exquisite detail as each butterfly wing is a door that opens to reveal a window covered in gold mesh, then the whole egg opens to reveal a revolving, porcelain rose ring holder. 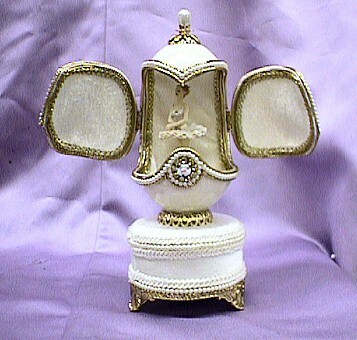 Each one is delicately hand made and crafted to look marble, absolute perfection. 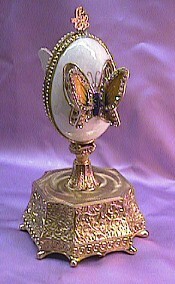 Features: 4 opening butterfly doors, a revolving rose ring holder and a very heavy guilded metal base. Fabulous! Plays "Wind Beneath My Wings"
A perfect gift to say "I Love You"! Absolutely beautiful, Limited Edition Collectors Musical Goose Egg. 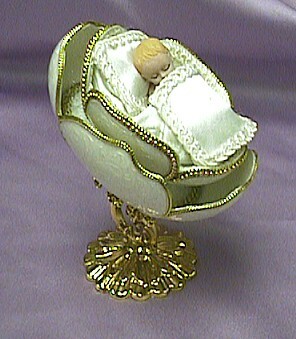 Exquisite detail and each one is delicately hand made and crafted to perfection. Features a revolving angelinside the four opening doors. Image shows doors open. Plays "You Light Up My Life"
Absolutely beautiful, is this Sleeping Baby Goose Egg. Fabulous detail! Each one is delicately hand made and crafted to perfection. Features real satin pillows and blanket and includes a certificate of authenticity. This item is NOT musical. Great gift for a new born! 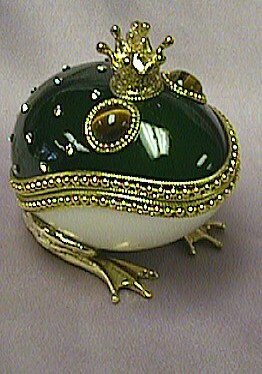 Absolutely beautiful, is this Frog Prince Goose Egg Jewelry Box. Each one is delicately hand made and crafted to perfection. Features a fully lined satin interior and includes a certificate of authenticity. This item is NOT musical. 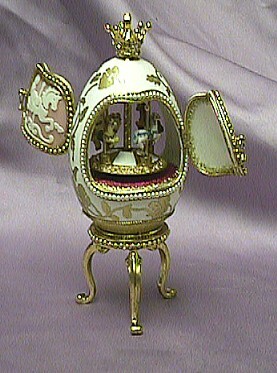 Absolutely beautiful, is this miniature musical quail egg. Each one is delicately hand made and crafted to perfection. 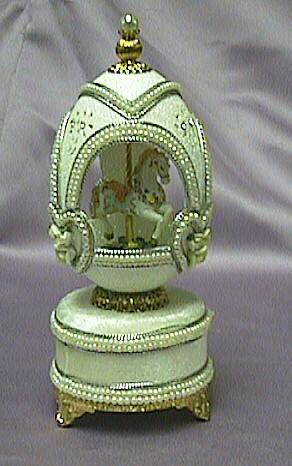 Features a tiny carousel horse and includes a certificate of authenticity. Approx 2" High. Plays the ever popular "Carousel Waltz". Absolutely beautiful, is this musical butterfly jewelry box with spectacular hand carved butterfly doors, that actually open like hinged windows. Each one is delicately hand made and crafted to perfection. 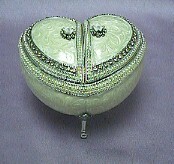 The top opens to reveal a fully lined satin interior, to store small jewelry, and includes a certificate of authenticity. Limited edition. Plays the ever popular "Wind beneath my wings". Absolutely beautiful, Limited Edition Collectors Musical Goose Egg. Exquisite detail and each one is delicately hand made and crafted to perfection. Features a revolving bride and groom, a strong metal carriage in a gold lacquer finish. 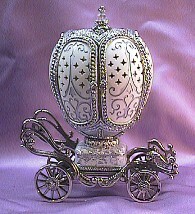 Absolutely beautiful, is this musical carousel horse goos egg , that revolves as the music plays. Each one is delicately hand made and crafted to perfection. Includes a certificate of authenticity. Limited edition. Features a revolving bride and groom inside , four incrdible opening doors. Plays "We have Only Just Begun"
Absolutely beautiful, is this musical Ballerina goose Egg. Each one is delicately hand made and crafted to perfection. Plays the ever popular "Waltz Of The Flower". A perfect gift for the Ballerina in your life! 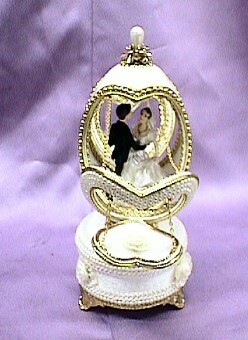 What a wonderful wedding or anniversary gift this would make for that special couple. 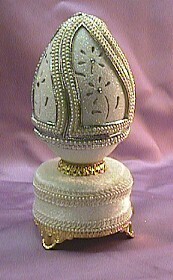 This absolutely exquisite cream colored goose egg would inhance any room that it is in!! Each one is delicately hand made and crafted to perfection and plays the tune "I Will Always Love You". 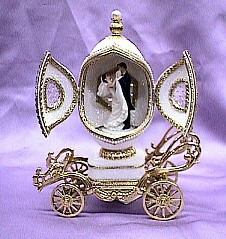 Features a revolving bride and groom with two opening doors that are in the shape of hearts. 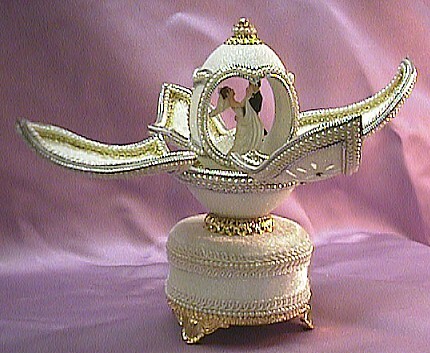 What a wonderful gift this would make for that special ballerina. 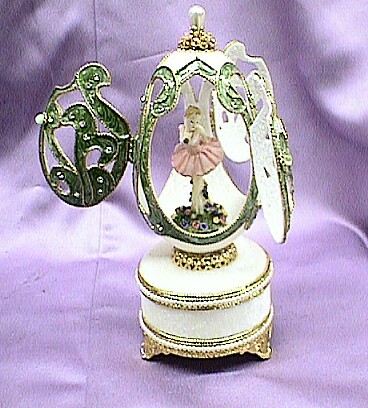 Each one is delicately hand made and crafted to perfection and plays the tune "Waltz of the Flowers". 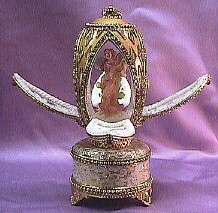 Features a revolving ballerina with two opening doors that have an inlay of swans on them. Click on picture to view full-size image Musical Wedding Ostrich Egg #10105 CHRISTMAS SPECIAL !!!!!!!!! Absolutely Gorgeous, Limited Edition Collectors Musical Ostrich Egg. Exquisite detail and each one is delicately hand made and crafted to perfection. 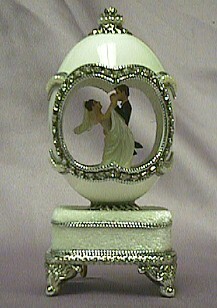 Features a bride and groom that revolves to the tune of "Mendelssohns Wedding March"
This egg has beautiful inlayed roses on the outside of the 3 doors. You can open or close them and they are supported by little gold chains.Inside the doors are creamed colored ribbons and lace with a rose in the center. Perfectly detailed with gold trim and tiny little pearls, there are also hearts with handpainted roses on the inside. *Please allow images to load and scroll down page to view!